Cleaning your pipe is important. Without regular and diligent cleaning, your wonderful new pipe will become a soggy, ill-tasting mess, and will no longer provide you with the smoking pleasure you desire. To eliminate such problems, you need to embark on a regimen of regular pipe cleaning and maintenance for your pipes. A smoker's rotation is the number of pipes they own, and the order the pipes are smoked in. This is an important concept to the care and cleaning of your pipes. First and foremost, because pipes need a rest in between smokes if they are to continue to function optimally. 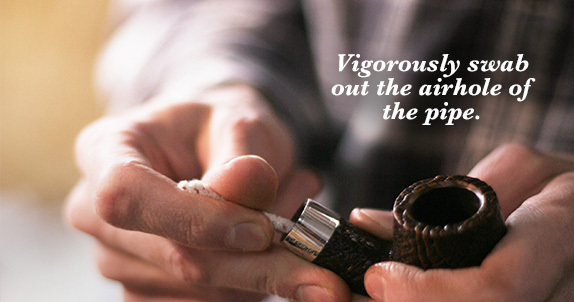 The care and cleaning of your pipe begins with your very first smoke, and should continue forward from there. Before each smoke, run a pipe cleaner, either bristle or regular, through the stem to dislodge any leftover ash and dottle, and gently tap your pipe on a cork knocker or the palm of your hand to remove these obstructions from the bowl. During a smoke is an excellent time to begin the process of caring for your pipe. You can begin by paying careful attention when lighting your pipe. 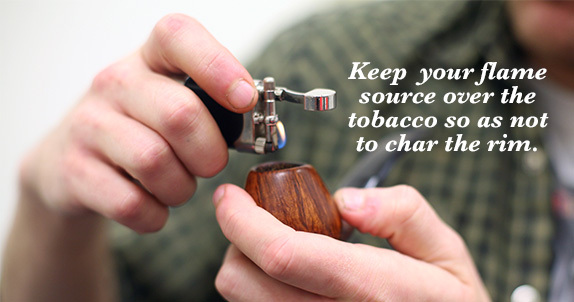 Keep your flame source over the tobacco, so that it does not char the rim of your pipe. If the rim of your pipes begin to develop a bit of a dark tint to them, it can usually be removed by moistening a pipe cleaner with saliva and gently rubbing the rim of the pipe with it. Done regularly, this will eliminate the cause of the charred, blackened rims so common on un-cared-for pipes. During smoking is also when you will notice if a more thorough cleaning is in order. If a pipe begins to taste sour, salty, or just plain bad while smoking it, it is probably time for a good cleaning. See Periodic Pipe Maintenance below. First, a warning: Do not remove the stem of a pipe while it is still warm. This will cause the fit of the stem to loosen, and can cause you to crack the shank or break the tenon of your pipe. 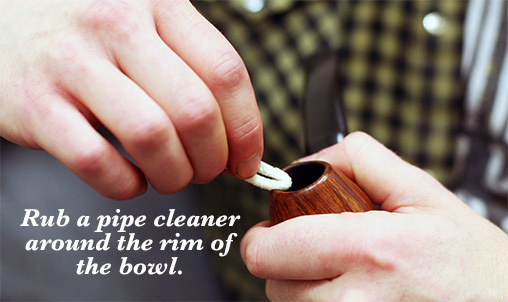 At the end of each smoke, your pipe should be given a good cleaning. Allow the pipe to cool, and then stir up any ash and dottle left in the bottom of the bowl. Placing one finger or the palm of your hand over the top of the bowl, shake the pipe for a few seconds to evenly distribute the ash along the inside walls of the bowl, which will greatly speed the formation of "cake," a protective layer of carbonized tobacco and ash inside your pipe. Cake acts as an insulator, greatly extending the life of your pipe and guarding against burn outs. See the Periodic Pipe Maintenance section below for instructions on maintaining the cake. Dump out the remaining ash and dottle, and run a bristle pipe cleaner through the stem until it is just barely visible in the bottom of the bowl. Remove it, and either turn it around or use another pipe cleaner, repeating this process until the pipe cleaners come out clean. Moisten a pipe cleaner with saliva and rub the mouthpiece with it to remove any buildup there. Blow gently through the stem of the pipe to dislodge any leftover ash and wipe your pipe down with a soft cloth, perhaps impregnated with a compound such as the Savinelli Magic Cloth. If you wish, you may insert a regular pipe cleaner into the stem of the pipe before placing it back on the rack, in order to absorb any residual moisture, but if you are diligent in using your pipe cleaners, this is not necessary. Place the pipe back on its rack or stand and allow it to rest, hopefully for two to four days before it is smoked again. You will want to, on occasion, give your pipes a more thorough cleaning than just swabbing out the stem after smoking. Most smokers do this fairly regularly, some going so far as to do so after all of their pipes have been smoked once, thus providing themselves with a fresh, clean rotation of pipes. You will have to experiment a bit with how often you do this cleaning to find what works best for you. To start this cleaning, carefully remove the stem of the pipe from the bowl and lay the two pieces on a paper towel. Dip a regular pipe cleaner in alcohol and run it through the stem, from the tenon to the mouthpiece, pulling it through. It will most likely come out with a bit of black or brown gunk on it. Follow this pipe cleaner with a dry one, and repeat the process until the moist pipe cleaner comes out the same color it was when it went in. Push one final dry pipe cleaner through to remove any moisture and set the stem aside. Using bristle pipe cleaners, moistened with alcohol, vigorously swab out the airhole of the pipe, alternating with dry, regular pipe cleaners. Don't be afraid to use a lot of pipe cleaners doing this. Pipe cleaners are cheap; new pipes aren't. If the airhole of your pipe is large enough in diameter that there is little resistance when you do this, you may want to fold the cleaner in half in order to scrub the sides of the airhole properly. Once your dry pipe cleaner comes out of the airhole the same color it was when it went in, run one more dry cleaner through the airhole to absorb any residual moisture. Using a cotton swab or shank brush, clean out the mortise, the portion of the pipe where the stem attaches to the bowl. A doubled over regular pipe cleaner will do in a pinch. If your stem or bowl has a band, now is the time to polish it, using a good silver, or other metal, polish, depending on what your band is made of. Carefully reinsert the stem into the bowl, and give the pipe a good wipe with a soft cloth, perhaps impregnated with a compound such as the Savinelli Magic Cloth. 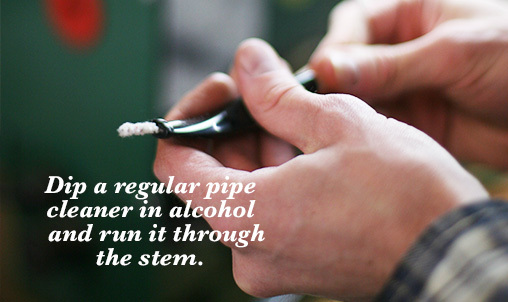 Cleaning over, allow your pipe to sit for a day or so before smoking it, to allow the alcohol to completely evaporate. If you have cleaned most or all of your briar pipes at once, now is a good time to smoke your meerschaums and corncobs you have been neglecting. For explanation of common pipe-related terminology, check out our glossary. For more on how to care for and clean your pipe, check out Pipedia. For more resources check out the pipe repair and maintenance forum at: Pipesmagazine.com.